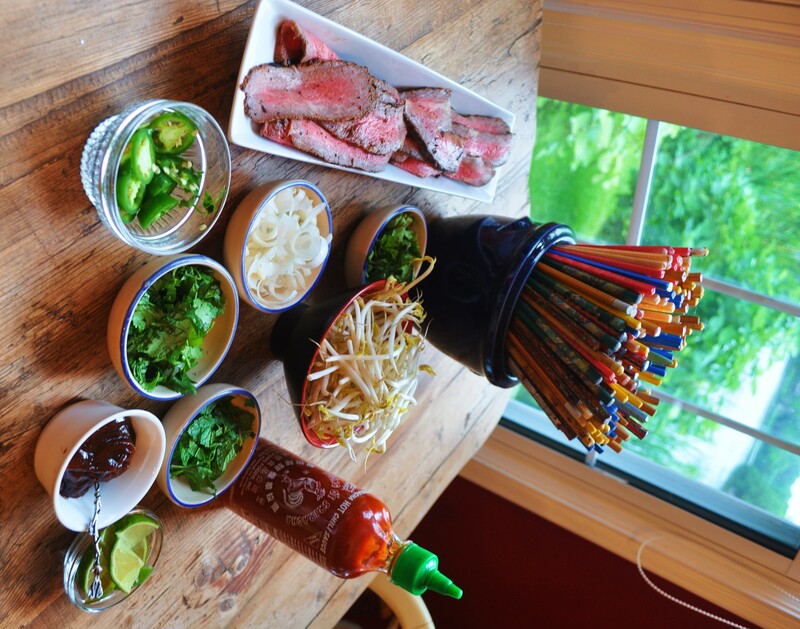 Big Daddy Does Pho | The Sassy Spoon: Fun Food! Big Daddy makes a few cooking attempts to ease my busy schedule. Last night he hit a homerun. 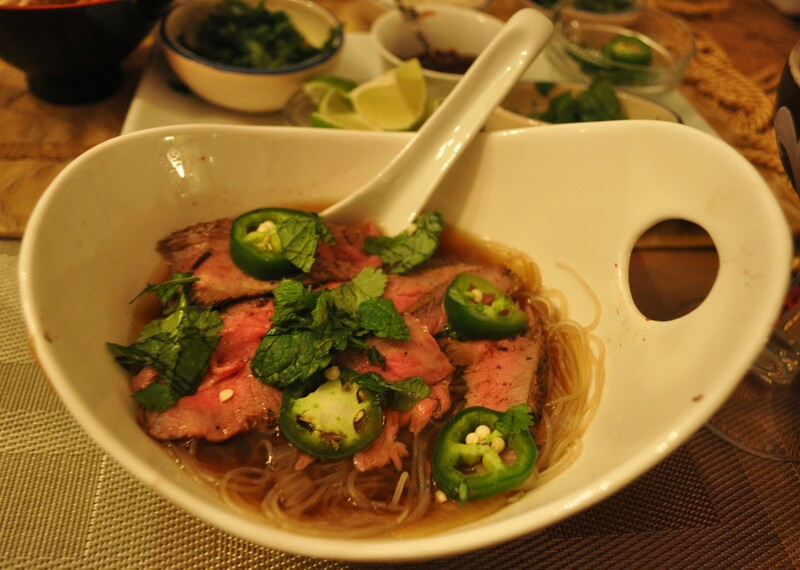 Pho (pronounced FA), the simple (yet complex) Vietnamese Street food charmed him when we lived in Hawaii. He is not one for exotic flavors, so this surprised me a bit. Since then we have been to several restaurants here in Charleston that serve Pho. He decided to make it and it was an astounding winner. We paired it with a Belgian Ale and that was a fantastic match too. We had some leftover rare beef (tri-tip) so he froze it and sliced it thinly. I usually ask for my meat on the side when ordering Pho in restaurants, I don’t like it over cooked. We have enough broth for at least two more meals. 1. In a large soup pot, combine broth, onion, ginger, lemon grass, star anise, cinnamon, and peppercorns. Bring to a boil, reduce heat, and cover. Simmer for 1 hour. 2. Arrange bean sprouts, mint, basil, and cilantro on a platter with chilies and lime. 3. Soak the noodles in hot water to cover for 15 minutes or until soft. Drain. 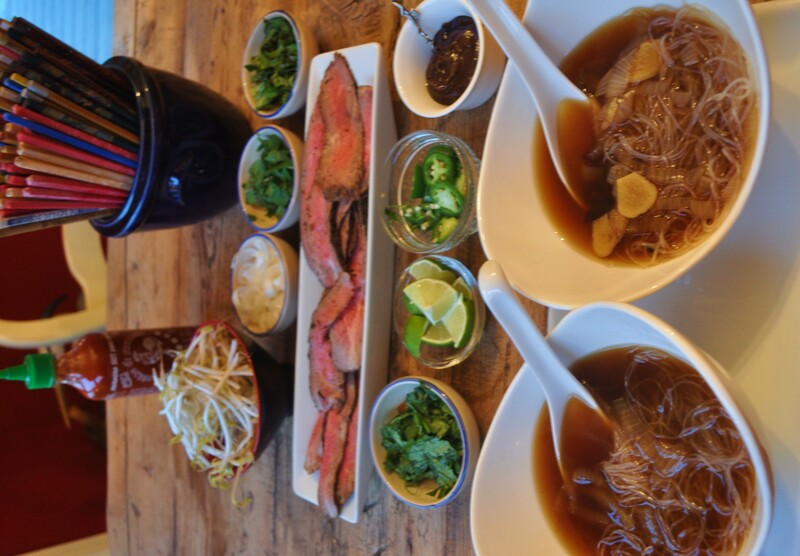 Place equal portions of noodles into large soup bowls, and place raw beef on top. Ladle hot broth over noodles and top with beef. Pass garnishes and sauces. Simply wonderful wonderful wonderful. The Pho is cooking now for later in the week and my kitchen smells sooooooo good. Thank you for posting the recipe. Glad you tried it Susan!